United States - Confederate States: 1862 5 cents, light blue, unused. 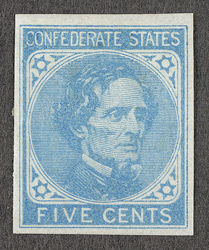 bl.uk > Online Gallery Home	> Online exhibitions	> Philatelic rarities	> United States - Confederate States: 1862 5 cents, light blue, unused. During the American Civil War from 1861 to 1865 the Confederate States issued their own stamps. In 1862 a supply of 5 cents blue together with the printing plate were ordered from Thomas De La Rue & Company of London. The first printing was made in London and afterwards from the same plate by Archer & Daly of Richmond, Virginia. Exhibited is the stamp as issued.